The sample is very representative, both for its size and the morphology of its crystals, among best-known crystallization of this rare phyllosilicate. 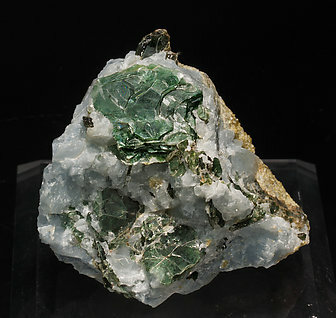 The crystals, with a very uniform dark green color, are laminar and are embedded on a matrix of blue Calcite and granular greenish-yellow Vesuvianite. The sample was obtained in the famous 2001 find that was described in an article in Mineralogical Record.